Astronomy is the foundation upon which astrology can operate. Actually, astrology and astronomy were treated together, under the Latin name of astrologia, being separated only by the Western 17th century philosophy. One thing is sure: a good astrologer needs to study astronomy. 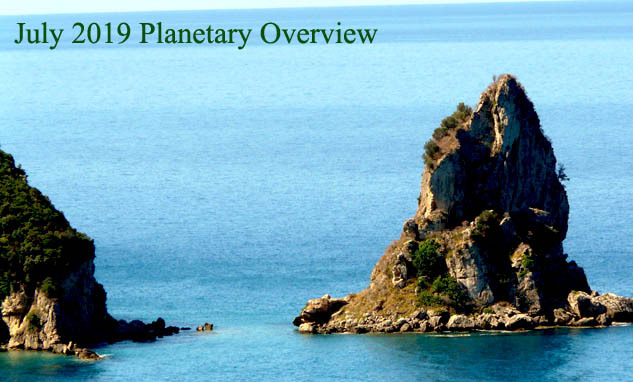 Here you can find the astronomy calendar for January 2019. The Quadrantid meteor shower is 2019’s first major meteor shower. This is an above average shower, with up to 40 meteors per hour at its peak. It is thought to be produced by dust grains left behind by an extinct comet known as 2003 EH1, which was discovered in 2003. The name comes from Quadrans Muralis, a former constellation created in 1795 by the French astronomer Jérôme Lalande that is now part of the constellation Boötes. Best viewing will be from a dark location after midnight. Meteors will radiate from the constellation Bootes, but can appear anywhere in the sky. 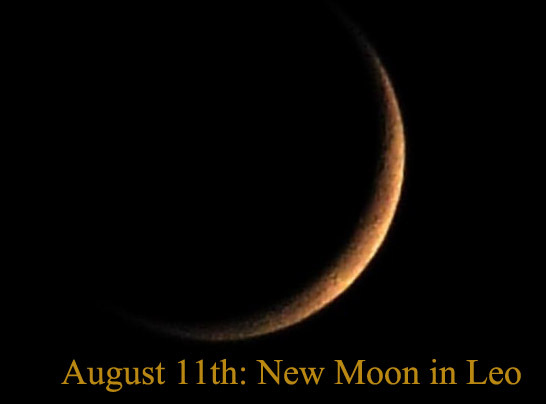 The New Moon is when the Sun and Moon are aligned, with the Sun and Earth on opposite sides of the Moon. The new moon is the first lunar phase, when the Moon and Sun have the same ecliptic longitude. At this phase, the lunar disk is not visible to the unaided eye, except when silhouetted during a solar eclipse. This is the best time of the month to observe faint objects such as galaxies and star clusters because there is no moonlight to interfere. Venus’s orbit lies closer to the Sun than the Earth’s, meaning that it always appears close to the Sun and is very difficult to observe most of the time. It is observable only for a few weeks each time it reaches greatest separation from the Sun – moments referred to as greatest elongation. This is the best time to view Venus since it will be at its highest point above the horizon in the morning sky. Look for the bright planet in the eastern sky before sunrise. The full moon is the lunar phase when the Moon appears fully illuminated from Earth’s perspective. This occurs when Earth is located directly between the Sun and the Moon (more exactly, when the ecliptic longitudes of the Sun and Moon differ by 180°). This means that the lunar hemisphere facing Earth – the near side – is completely sunlit and appears as a circular disk, while the far side is dark. 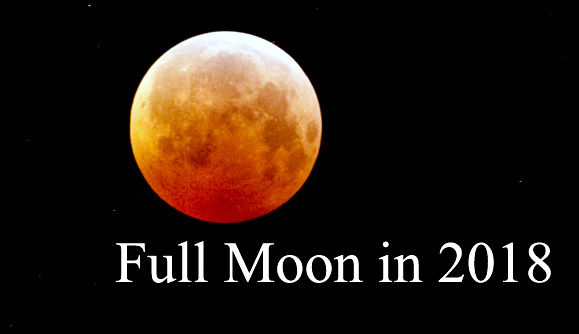 This full moon is also the first of three supermoons for 2019. The Moon will be at its closest approach to the Earth and may look slightly larger and brighter than usual. The January Full Moon was known by early Native American tribes as the Full Wolf Moon, because this was the time of year when hungry wolf packs howled outside their camps. Other names for this full moon were Old Moon or the Moon After Yule. The eclipse will be visible throughout most of North America, South America, the eastern Pacific Ocean, western Atlantic Ocean, extreme Western Europe, and extreme Western Africa. Venus and Jupiter will share the same right ascension, with Venus passing 2°26′ to the north of Jupiter. The two bright planets will be visible in the early morning sky. 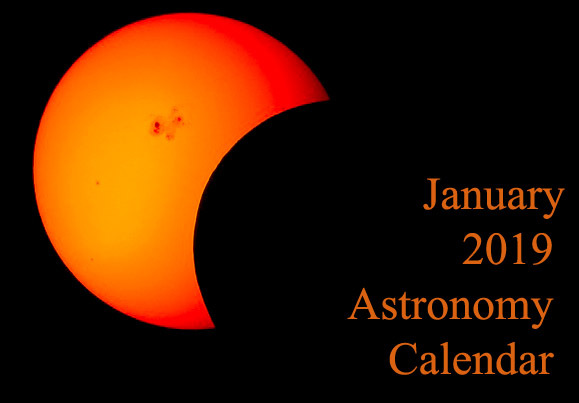 Share the post "January 2019 Astronomy Calendar – Celestial Events"